used to head reports, invoices and statements. Each sub-system also uses a common account file to specify accounts acceptable for data entry when processing. Unfortunately, the account file used for the general ledger is different from the account file used for receivables and payables. As a result you can create an account in a sub-system that is not a general ledger account. The system will detect this discrepancy when you update the general ledger, but in a system as sophisticated as this one, this type of problem should not occur. If this system had been packaged for the hard disk unit, an account assignment problem would have never occurred. The account file used for all applications would have been the general ledger file and no mismatches would have been possible. Because the system was packaged for a floppy environment, it was probably impossible to have the general ledger account file resident while receivable and payable processing was in process. A special account file to verify account assignment was an accommodation to the limited storage available. The use of an account file is not a problem for implementing accounts receivable and order processing. Even with a relatively large number of products the number of accounts affected by the receivable application is small. Accounts payable is another story. This application is the front end of the general ledger. You must place any account that could be affected by a cash payment in the valid account file. You may have to enter the majority of general ledger accounts in this file. With a complicated chart of accounts, this will be a time-consuming and potentially error-prone procedure. I am sure this task will be eliminated on the first true hard disk version of the Cobol accounting system. If this system is implemented before the hard disk version is available, it is desirable to create the valid accounts file from a printout of the general ledger chart of accounts. As you might expect, correction of a mismatch detected during the general ledger update process is inconvenient and time consuming. You cannot correct the improperly coded transaction until you add an account with that coding to the chart of accounts. If posting then continues and the new account causes report preparation problems, the offending transaction will cause further inconvenience. You must then make an adjusting journal entry to transfer the amount to the proper account and delete the temporary account. hand inventory in some detail. You had to enter inventory purchases into the order entry system with a file maintenance program. In a fully integrated accounting system, the accounts payable sub-system should supply inventory purchase data. This element of integration is unavailable in the Cobol system as currently supplied. In the future, or in a custom program, this level of integration could be added. Such a module would be called a "purchase order management system" and would use as input purchase advice data generated by the order entry system and receipts generated by the accounts payable system. The Accounts Payable system uses installation procedures similar to the other sub-systems previously evaluated. As was the case in receivables, an alphanumeric vendor code is allowed. The balance of the data to be entered is not complicated. There is a provision for up to three address lines, type code, normal vendor terms, last purchase date and a purchase history. The operator can specify with a status code if the discount is always to be taken regardless of invoice dates or if the system is to hold all payments. If you select the option to hold payments, no checks payable to that vendor will be allowed. You will have to make payments manually. With an additional code, you could use the system to accumulate non-purchase data. While the purpose of this option is not explained, it appears you could use it for statistical purposes. The system maintains purchase statistics on a comparative basis. This data could be very useful in defining vendor relationships. At the end of the year, a closeout procedure clears out the current year's data and transfers the totals accumulated to the prior year. Since both purchases and discounts taken are maintained, reports of these totals should be very valuable. In operation, you enter data into this system by use of vouchers. The system allows entry of four types of vouchers: regular vouchers, cancellation vouchers, non-A/P check vouchers and adjustments to previously recorded distribution vouchers. When you select the add voucher option, a screen which allows entry of part of the voucher detail is displayed. This data corresponds to the upper portion of a handwritten voucher and indicates the system-assigned voucher number, transaction type (detailed above) vendor code and name, distribution date, purchase order number and vendor's invoice totals. Once this information is recorded, distribution of the invoice amount is required. There appears to be no limit to the number of distributions available; however, only the last two (the current entry and a running total of the balance yet undistributed) are displayed. In some organizations complex invoice distributions are required. Retailers, for example, may make bulk purchases of supplies and ship the material to many stores. It is not unusual in such a firm to require 20, 30 or more distributions of an invoice amount. This payable system would be useful in such an environment; if the system capacity (1500 vendors, 800 open items, and 5000 general ledger distributions) is adequate, it should be considered suitable for installation. You enter vouchers into a buffer. There you can alter them with comparative ease. However, once they are posted to the Accounts Payable file, editing becomes more complicated. Since an error such as an improper account coding could be difficult to correct after posting, the system provides a method of adjusting the distribution of posted vouchers. This is typical of the options available for transaction handling and help to make this system quite user-friendly. After you enter transactions, edit reports are available. They are similar to the other systems in content and format. A description of any codes which you might use in the detail line of the report are clearly spelled out in the body of the report. This is a thoughtful touch which casual users of the system's reports will appreciate. If you make an incorrect or unacceptable response to a prompt, the system prints a short banner message indicating options available and their meaning. If you attempt to leave a screen without completing some essential piece of information, the system inhibits exit until you enter the missing data. Once you have mastered all the system convetions, it is quite easy to use. One of the main reasons for installing an automated accounts payable system Is to take advantage of vendor credit. With the high interest rates, this form of credit may be the best way for a firm to grow. This system contains reports which allow optimum use of this means of financing. You can generate cash requirements and lost discount reports which would be quite difficult to prepare with a manual system. Proper use of these reports could generate enough income to pay for the complete computer system over and over again. Prepaid shipping when order is pre-paid. Your Choice: Teac or Tandon 5V4-inch disk drives, complete! New! Tandon "Thinline" 8-inch disk drive, complete! New! Hard disk drives for Model III — Ready to plug in and run! Shipping costs additional except where otherwise noted. Ann Arbor: 3446 Washtenaw Ave., Ann Arbor, Ml 48104 (313) 973-2312 Open M-F 10-6, Sat. 10-5. Telex: 220-821-HPC Fowlerville*: 111 North Grand, Box 1071, Fowlerville, Ml 48836 (517) 223-7281 Attention Dealers, OEM's 8t Distributors: Call us for details on our attractive pricing. "Authorized Radio Shack Dealer. ™TRS-80 trademark Tandy Corp Prices subject to change without notice. artist. A musician can write music using anything from a pen, to a tape recorder, to a computer. And there's the rub; as soon as you mention a computer, people get fidgety and start wondering how much the computer had to do with it. Does storywriting lose any of its artistic value because it was written using a word processor? Does a delicate pattern lose any of its visual appeal because it was created on a video screen? "I think most people would agree that the answer to both these questions is no. But how about when a whole story is apparently written by a computer? Well of course it wasn't written by a computer: It was written by a program which ran on a computer. The author took one extra step and created a program as an invisible part of the creative writing process. The more work that is put into the program, the less work that may be needed. This is where computers bring a whole new dimension to the artistic world and in my opinion may change the fabric of many art forms. "The computer-generated novel is in reality written using certain aesthetic parameters that were placed in the program (whether consciously or not) by the human author. That author still has to decide whether or not the end result has anything approaching quality. All he has done is left the process of composition until after the composition was performed. "Another exciting thing that computers do is allow much faster experimentation with a central idea. This idea has already been used in the field of computer music. Imagine the effort involved in taking a Beatles song and rewriting it in a baroque style, or calypso, or jazz. With each effort the composer (or recomposer) may be risking hours of work possibly to be rewarded with disappointment. "A computer can easily manipulate the data (in this case the musical score) and allow many separate attempts at recreation. Using systems like the New England Digital musical synthesis system (the Synclavier), it becomes possible to change the instruments while a piece is actually being played. With this system, instead of the interface to the computer being through a typewriter-style keyboard, the input is mostly through a piano-style keyboard. This has the psychological effect of removing the computer from the creativity loop, placing into the background the uncertainty of "who's doing what—human or computer?". "This versatility is not without its price. The possibilities opened up by having a computer handle the donkey work can be almost endless. Unfortunately, many artistic people have a difficult enough time knowing when to stop without having thrust upon them the temptation of improving the result by yet another try. "Another useful function that can be performed by a computer is in providing random elements to the creative thought processes of the artist. Many times artists fall victim to their own previous output and fail to come up with new ideas simply because they are in a rut. Computers are great at doing things in too literal a manner, thereby producing results totally unpredicted by the artist-programmer. This phenomenon can be exploited in all sorts of ways to initiate a synthetic brainstorming session between human and computer. "So now we finish up almost on speaking terms with the computer. Nothing to be afraid of was there? The computer plays its part in the creative process but takes no more from the artist than the artist puts in, exactly the same as with our numerical artist friends—the mathematicians; where would they be without the computer? Few people think of mathematicians as artists, so nobody ever questions the role of the computer and whether or not it compromises the aesthetic qualities of the mathematical concepts or results that have evolved in the last 20 years. The mathematical art is probably more refined as a result of computers than it ever was. "As micros become more of a way of life for everyone, I feel we are about to embark on an exciting new creative period. No doubt there will be a vogue for a while of art for computing's sake, but when that passes we will have a generation of artists that can place the computer in the creative process to any extreme they desire and produce "art." That period can be now if you want it." There will always be those who prefer the classics to the avant-garde. After all, how can a Botticelli be compared with a screen-printed painting by Andy Warhol; and yet they are both immensely popular. Although you may not prefer computer-composed art, it is still necessary to acknowledge it, if only for the reason that it exists. It is a creative endeavor between man and machine that is certain to evolve in the future. Janet Fiderio Feature Editor f0 »ecoy WftKf any size firm. Check preparation with this system is relatively easy. You can select vouchers to be paid by several criteria. Once you have determined the criteria, the system will go through the files and select those vouchers which meet your requirements. You can review the vouchers selected and make decisions to pay on a voucher-by-voucher basis. The system allows partial payment of a voucher. After the selection process has been completed, you can prepare a pre-check writing report. If this report indicates that all is well, you can write checks. 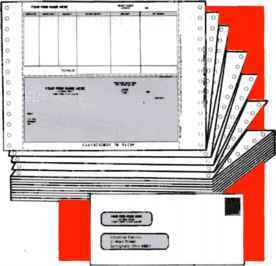 The system uses preprinted check forms described in the documentation. You can obtain the forms from a vendor recommended by Tandy or the firm's normal forms supplier. If you select Tandy's vendor, they provide either a one part or three part form. Since the system does not retain any historical data, you should keep a printout of the actual check and remittance advice. Then should research into a vendor's payment history be required, data will be available. For this reason, I suggest use of the multi-part form. The remittance advice portion of the check form has room for up to 16 vouchers. If this number is exceeded, the system voids the check portion of the form and continues printing the voucher detail on the next form. Only one check is allowed for each vendor. If the amount selected for payment, net of credits is negative, a check will not be printed. The system allows printing zero balance checks. This allows the user to send advice to the vendor detailing how credits were applied to open invoices. Because printers could fail or in some way destroy the checks printed, an option is available to restart the printing process. If you must void all the checks as a result of printer failure, you can accomplish this with a single command. After a successful batch of checks has been prepared, the system creates a check register. Faster, easier, more powerful programming! STSC's APL* PLUS 780 System brings the productivity of APL to your TRS-80c Model III. Here's your escape from the restrictions and wordiness of BASIC. With our APL*PLUS/80 System, you can develop and maintain programs in one-fourth to one-tenth the time needed with BASIC, because one symbol in APL often does as much as an entire statement in other languages. So you can write applications in APL that you'd hesitate to attempt in BASIC. • complete documentation, including APL is Easy! (introductory tutorial), .¿PL textbook, and a set of four detailed user's guides and reference manuals-everything to support the beginning user to the experienced API. programmer. APL* PLUS/80 runs under TRSDOS 1.3 or LDOS on a 48K RAM TRS-80 Model III with two disk drives. The APL* PLUS/80 comes with custom APL character ROM. Join the software consultants who have already selected APL* PLUS/80 to develop and deliver solutions. Mail in the coupon below with your payment and we'll rush you the APL* PLUS/80 System-all you need to run APL on your TRS-80 Model III today. We've prepared a free information package to answer your questions about APL, APL* PLUS/80, and their advantages to you as a TRS-80 user. Just send in the coupon. We're STSC, Inc.. the largest supplier of professional quality APL software and services in the United States. Our APL* PLUS systems have been serving the business and professional world for more than 12 years. Draw a bar graph on a cleared screen with up to 13 vertical bars 5 pixels wide (separated by 5 pixels) using heights given by keyboard input.